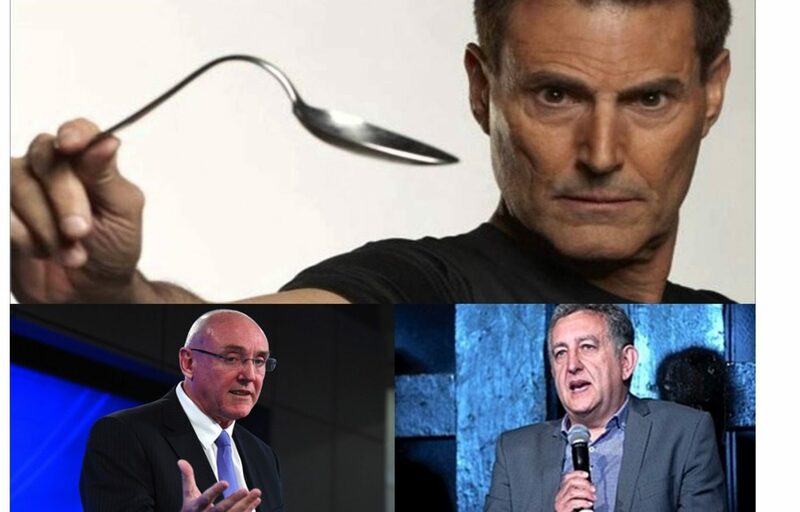 ‘And the Bent Spoon Award goes to…?’ The NICM nominated for the second year running!! Reminiscent of Voldemort about to cast an evil spell, Prof Barney Glover (photo BL – resemblance is striking) is showing a packed auditorium his outstretched hand above which the mystical ‘life force’ or Chi hovers. Because no one, not even Barney, can see anything floating above his hand, Prof Alan Bensoussan (photo BR) comes to the rescue by explaining that if everyone just play along, and make as if they can see Chi, then they all stand to make a lot of money. His strenuous expression indicates that it is a hard sell, but he also knows that the money factor and quality of showmanship, usually attracts a crowd and also wins out over common sense. The photo on top is from Voldemort, the villain from the Harry Potter movies. The reason why these three men looks so serious (excl. Voldemort because he is an actor, oh no, wait, all three are actors) is because they know damn well that what they are doing is ‘magic’. So, we are entering an era where all three these characters are real, or scientists should start to stand up for science! For continuing to promote unsupported and debunked ‘medical’ treatments, despite promises late last year, in response to a 2016 Bent Spoon nomination, that they are “intending to revise our website … and hope to address some of these issues you have raised”. It still promotes the following treatments under the Complementary Medicine banner: acupuncture, chiropractic, aromatherapy, naturopathy, spiritual healing, crystal therapy, reflexology, ‘energy therapies’ (reiki, qigong, electromagnetic field therapy), TCM, Ayurvedic medicine, anthroposophical medicine, healing touch, Rolfing, Feldenkrais, Alexander technique, and homeopathy. Secondly, NICM and UWS are nominated for planning to establish an on-campus TCM clinic for the general public. Hopefully this year they will walk away with this coveted award, which is bestowed upon “the perpetrator of the most preposterous piece of paranormal or pseudo-scientific piffle.” In 2016, the NICM tried for some reason, but in vain, to remove their nomination, but their attempts backfired somewhat. You can read about their sorry attempts here. It is also notable that the 2016 nomination was done by one person, whilst the 2017 nomination was done by a group of people, indicating that more and more people are coming around to the fact that the NICM/WSU are indeed misleading the public. Key people in this year’s nomination is again the director of the NICM, Prof Alan Bensoussan, and the Vice-Chancellor of WSU, Prof Barney Glover. Between these two men, they earn roughly $1.2 million AUD per year, dished out by the Australian public. In return for these vast sums of money, the Australian public are being misled into believing that all of the above therapies are useful, effective and safe. This is obviously not true as you can see in my previous article which dealt with the involvement of the NICM and WSU in the tragic case of the 6yo boy who died after attending a Traditional Chinese Medicine (TCM) based ‘slapping therapy’ workshop in Sydney. By slapping yourself you supposedly influence the flow of Chi through meridians and hence you will be cured of disease. Unfortunately, this boy suffered from diabetes and because many people belief that Chi is real, he was taken off his medication during the workshop – a life-threatening scenario. Clearly the ‘treatments’ that the NICM promote is not only ineffective, but it can also be quite dangerous. But let us look at Alan Bensoussan. As a registered acupuncturist and herbal Chinese medicine man, he obviously falls within the category of delusional ‘healthcare’ practitioners. Because his livelihood depends on it, he will continue his unwavering support of debunked treatments, even in the face of overwhelming scientific evidence that these ‘treatments’ simply does not work. Ineffective treatments is quite dangerous, not only to people, but to wildlife as well. In his delusional world, all TCM therapies are effective and hence he will happily go to court to act as a character witness for his business partner (another TCM practitioner) who was send to jail for importing Rhino horn, and other endangered animal material, into Australia. This was followed by promoting rhino horn as a life-saving medicine in a thesis, approved by Alan and WSU (2012). And quite recently (2017) the NICM even had a link on their website where consumers could find information regarding the life-saving properties of rhino horn, and I guess they could even buy it online (link has since been removed). Everything works in his delusional world. There are many more examples such as his continued support for debunked treatments such as homeopathy, acupuncture etc. but this award is not only for supporting these treatments, it is also the way in which they mislead the public. For example: they fail to declare their many conflicts of interest on many of their research papers (scientific misconduct), they design their experiments in such a way that it almost always gives a positive result (A+B vs B trial design), and even if the result is negative they will promote it as a big positive on WSU’s news site, or on social media (scientific misconduct and intentionally misleading the public). They even misled the Australian Research Council (info obtained after 2.5 years under a Freedom of Information request) who gave them a ranking of five, which stands for ‘research quality well above world standard’ in their ‘Excellence of Research for Australia’ program. With this fraudulently obtained ranking, they lobby, but also mislead; UK royalty, ministers, regulators, foreign governments (specifically China) etc. in order to invest more money in the NICM. But they also use this ranking to try and crush any negative reports, such as their 2016 Bent Spoon nomination – and this is where the excellent acting comes into play. Here is an excerpt from Alan’s letter to the Australian Skeptics “NICM conducts itself with the highest degree of integrity, ethics, scientific enquiry and social responsibility. Our research is independent, peer-reviewed, and is published in highly reputable, world-leading journals. NICM has been evaluated by Australia’s leading scientists under the Excellence in Research for Australia scheme and received the highest ranking of 5 for two consecutive periods, representing research that is deemed well above world standard.” None of this is true, and yet they can write these things without blushing. Their acting ability is so good, that they do not only fool the public, they actually have the acting ability to fool themselves. Any actor that can immerse themselves into a role to a point where they become the character deserves an Oscar, or in this case a bent spoon. development of an effective Integrative Medicine Facility or TCM Hospital.” The BUCM has managed to start a similar 81-bed ‘hospital’ in Germany and this will likely be the model on which the Sydney facility will be based. So much for ‘evidence-based’ treatments, where evidence that a treatment does more good than harm comes first, before you start selling it to the public. But in their delusional world, all of TCM, and for that matter all of complementary medicine, works – so why should they provide any evidence? You only have to belief that it works, and that is it! At the heart of all of this, as usual, is money. The millions that Barney, Alan and the NICM cost the Australian public has to be recovered somehow, and hence these two men decided to destroy science, scientific education and put the public’s health at risk by allowing WSU to become the ‘scientific’ façade of a very dubious, and dangerous, complementary medicine industry. In exchange, they are handsomely rewarded with very big donations towards their ‘research efforts’, or rather, promotional research. Here they received $10 million from Blackmores, here is $4 million from the highly controversial Jacka Foundation (links with anti-vaccination activists), not to mention the millions from other complementary medicine companies, including Chinese companies and investors. The list of misleading and false claims and statements constantly flowing from the NICM is unfortunately so long that it will require a series of books to be written in order to cover everything. It is however, quite remarkable, how similar their modus operandi is to the notorious gangster, Al Capone, who also had a ‘good guy’ public image, but beneath the surface had a somewhat more sinister nature. But the sad thing is that nobody can seemingly do anything about this. As long as they are in a position of power and they manage to bring in this kind of money; rules, ethics and morals simply do not apply anymore. As further evidence of their extremely good acting abilities, here is the title of Voldemort’s, oh sorry, Barney’s speech given at the National Press club (photo) “universities must stand up for facts and the truth – if we don’t, who will?” This is acting at its best, and in my view, deserving of the Bent Spoon award. Unfortunately, if you fall for their trickery and you get hurt, then you will be all alone. The bureaucracy involved is extremely complex so the best thing to do is prevention. Stop believing that Chi is real, because it simply does not exist. Stop buying their products or using their treatments, and inform yourself and your family and friends about how these people play their sick game and what the dangers are regarding these ‘treatments’. ‘Friends of Science in Medicine’ provides valuable healthcare information as well as the website of Prof Edzard Ernst, where he discusses everything complementary medicine (what works and what doesn’t). If you are interested in receiving automatic updates regarding the NICM and what they are up to, you can always follow my Blog, Twitter or connect on LinkedIn. Will keep you posted regarding the outcome of the 2017 Bent Spoon awards, and please, ‘Like’ and share this article – options below. “Swallowing It!” The ABC’s ‘Four Corners’ takes a look at the Australian vitamin and supplement industry. And the NICM’s role in all of this? “Swallowing it: How Australians are spending billions on unproven vitamins and supplements.” A catchy title and a very important subject to investigate. It is however unfortunate that the term ‘unproven’ is used, instead of ‘disproven’. There is a major difference between these two terms. The former means that vitamins and (mineral) supplements has not been tested, and therefore it is unknown if it is beneficial or not, whilst the latter indicate that it has been tested, to infinity and beyond, and it was shown not to be beneficial for most people, but for a select small group of people and for very specific conditions (e.g. vegans, pregnant women etc.). In reality, it has been tested, over and over – very little benefit and it might even carry a risk. It is therefore mainly disproven. Herbal supplements are somewhat different. Many, such as St Johns Wort and Gingko biloba, have been tested thoroughly, whilst many haven’t. Therefore, we have a combination of unproven and disproven herbal supplements and very few that might actually be beneficial. Having said that: this does not matter one iota for the Complementary Medicine (CM) Empire – they just couldn’t care less. Why do I call them an Empire? Because of the remarkable similarities between their modus operandi and that of the well-known gangster, Al Capone. You can read about it here and here. A large clinical trial, called SELECT, (involving more than 35 000 men) was conducted to test if Vitamin E and Selenium prevents prostate cancer. It was stopped prematurely because not only did it not prevent prostate cancer (no benefit), there were, although not significant, “….more cases of prostate cancer in men taking only vitamin E” (indicating that it might actually be harmful). Based on this information, any responsible scientist will now conclude that the benefit of taking this supplement for the prevention of prostate cancer has now been disproven (no benefit and it might even be dangerous). Simple stuff. So, is the naturopathic advisory service the ‘health professional’ that the NICM refers to in their statement? This is a simple example of how it works. These people (and I have to exclude those very few that are conducting unbiased research into CAM’s) cannot accept that most CAM’s doesn’t have any benefit, some are dangerous and very few might be beneficial. If they do, and advise the public accordingly, their whole empire will collapse. And as usual; it is all about money and therefore it might be a good idea to keep an eye on the share price, before and after the Four Corners program airs, of the main producer of these products in Australia, Blackmores. It just might give us an indication if this program will have any sort of impact. The Four Corners program airs tonight (13/02/2017) at 8:30 pm (AEST) but will also be archived on their website, that you can find here.